CHISHOLM, WILLIAM, militia officer, farmer, politician, office holder, jp, and businessman; b. 15 Oct. 1788 in Jordan Bay, N.S., son of George Chisholm and Barbara McKenzie; m. 23 May 1812 Rebecca Silverthorn, and they had four daughters and seven sons; d. 4 May 1842 in Oakville, Upper Canada. William Chisholm’s father was a Highland Scot who emigrated to Tryon County, N.Y., only to be swept up in the American revolution. 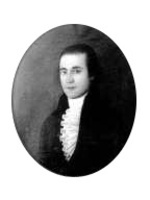 A loyalist and member of the Port Roseway Associates [see Gideon White*], he stopped with his growing family for a few years in Nova Scotia before moving by 1793 to Upper Canada, where his brother John had located. George eventually settled in the area of Burlington Bay (Hamilton Harbour), where William and his brothers grew up. In August 1812, less than three months after his marriage, William participated as an ensign in the 2nd York Militia at the capture of Detroit. In October he fought in the battle of Queenston Heights and two months later was promoted lieutenant in his unit. 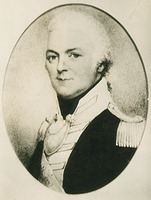 Gazetted captain in the 2nd Regiment of Gore militia shortly after the war, he became lieutenant-colonel in 1824 and colonel in 1831. By 1816 he had moved to a farm in Nelson Township, where he helped frame the local reply in 1817 to Robert Gourlay*’s enquiries about the state of affairs in Upper Canada. At the district level and at the Upper Canadian Convention of Friends to Enquiry in York (Toronto) the following summer, Chisholm was a consistent supporter of Gourlay. In 1820 he was elected in Halton to the House of Assembly, where he would vote for the repeal of the Sedition Act and against the expulsion of Barnabas Bidwell*. Although he did not run in 1824, he supported the candidacies of reformers John Rolph* and John Matthews* in Middlesex. At the same time he began to act as agent for William Lyon Mackenzie*’s Colonial Advocate. In early 1826 Chisholm entered upon the road to becoming “a ratted Gourlayite, and reformed reformer,” as he would later be called by Mackenzie. That January Chisholm was still railing against Lieutenant Governor Sir Peregrine Maitland*’s actions in denying to those who had participated in Gourlay’s 1818 convention the Prince Regent’s bounty of land for military service. “If we don rong try us by Law and punnish us,” he exclaimed to Mackenzie. But at the end of May he coldly notified the editor of the Colonial Advocate to appoint another agent and cancel his subscription. During the 1828 election campaign, although Chisholm was not a candidate, he was included on Mackenzie’s legislative “Black List.” During the rebellion of 1837–38 he commanded Allan Napier MacNab*’s left flank in the advance on Mackenzie’s rebels at Montgomery’s Tavern. Chisholm’s political conversion may have been partly the result of his access to patronage. 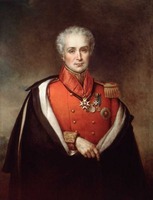 In 1824 he had received his lieutenant-colonelcy. He became postmaster of Nelson Township and a commissioner of the Burlington Bay Canal in 1825 [see James Gordon Strobridge*], and was made a magistrate in 1827. After the belated award of his militia land bounty the following year, his political sympathies clearly lay with moderate conservatism. His fortunes on the hustings – he was elected in 1830 and 1836 and defeated in 1834 and 1841 – reflected the lot of the tories provincially. Chisholm had become a champion of the Burlington Bay Canal and a director in the nearby Desjardins Canal [see Peter Desjardins*] for more than reasons of patronage. Not long content with farming, he had opened a general store, and by 1827 this operation included a licence for an inn and a still. By 1822 he was engaged in the lumber trade, and began acquiring a small fleet of schooners. He had also become a partner by 1829 in the Wellington Square (Burlington) firm of McCay, Smith and Company, which had a store on Burlington Beach. Chisholm’s shipping and lumbering interests in Halton County led him to look closely at land reserved for the Mississauga Ojibwa Indians at the mouth of Sixteen Mile (Oakville) Creek. Although his interest in the area had been evident since 1822, it was not until the spring of 1827 that he made a concrete proposal to Maitland for acquiring the land. In response to this initiative, the reserve was put up for auction and purchased by Chisholm that summer for £1,029. One of his priorities for the site was the development of a shipyard and harbour. Within a year of the purchase Chisholm and his men had “laid out a town,” Oakville, and “built a Warehouse for the reception of produce there.” In 1828 Chisholm succeeded in having an act passed vesting in him the rights for the use of the harbour for 50 years. In August of that year, long before the harbour was complete, Chisholm’s men had turned out the first in a long series of schooners. Five years later the shipyard launched its first steamer, the Constitution, which had been promoted by Chisholm, Colin Campbell Ferrie*, and others. 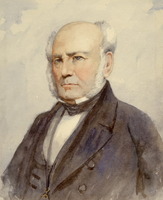 Chisholm’s experience in harbour development would be called upon again when he was asked to serve as a harbour commissioner for York with Hugh Richardson* and James Grant Chewett* in 1833. As Oakville grew, Chisholm’s affairs became more deeply entwined with it. He owned the first tavern (by 1828), sawmill (1830), and grist-mill (1833), and shortly afterwards was appointed collector of customs (1834) and postmaster (1835). But this façade of prosperity proved deceiving. Chisholm’s Nelson Township property, mortgaged in 1829 to finance work at Oakville, was put on the market in 1834. It would be 1839, however, before he finally sold the 12-room house, its outbuildings, his merchant’s shop, and a second dwelling, and moved to Oakville. The payments for the townsite were completed on schedule in 1831, but to finance the completion of the harbour Chisholm had to get a £2,500 mortgage from the government. Not long afterwards, he gave a second mortgage, for £6,500, to Forsyth, Richardson and Company, the Montreal mercantile firm. A further mortgage in 1839, to the Gore Bank (of which he had been a director), testifies to the great expense of the development and to Chisholm’s difficulty in liquidating the debt. His business investments left him by “no means in affluent circumstances,” according to post-office inspector Charles Albert Berczy*, who after the rebellion also employed Chisholm for secret service surveillance. By 1841 Chisholm was devoting much of his energy to the improvement of the colonization road to the Owen Sound district, as well as to other government-sponsored schemes for development. In 1840, with others in Oakville, he had privately incorporated the Oakville Hydraulic Company, to develop further the water-power of Sixteen Mile Creek. The company failed and with it Chisholm, his brother George, and his brother-in-law Merrick Thomas. The sheriff’s sale of their property was held on 2 March 1842. 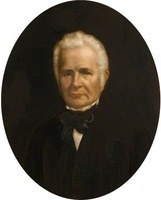 Though very much a regional figure, William Chisholm, for most contemporaries, was associated with one community, Oakville. At a dinner in 1836 he was toasted by assemblyman Archibald McLean* as “a gentleman whose liberality and honourable conduct were universally known and esteemed – and to whose enterprise, energy and public spirit, Oakville was indebted for most of the advantages she at present enjoyed.” The connection of the Chisholms with Oakville did not end with William. His son Robert Kerr succeeded him as postmaster and collector of customs. Another, John Alexander, took over mills there and his eldest son, George King*, became mayor in 1857. AO, ms 106, “The Chisholms of the parish of Croy, Inverness-shire, Scotland,” comp. Hazel [Chisholm] Mathews (typescript); ms 516, William Chisholm to W. L. Mackenzie, 28 July 1824; 10 Jan., 23 May 1826; RG 1, C-IV, Trafalgar Township, concession 3 (South Dundas Street), lot 13. Halton Land Registry Office (Milton, Ont. ), Abstract index to deeds, Nelson Township, concession 1, lots 9, 14; Trafalgar Township, concession 3, lots 13–16 (mfm. at AO). Oakville Hist. Soc. Museum (Oakville, Ont. ), Chisholm papers (mfm. at Oakville Public Library). PAC, RG 1, E3, 10: 120–22; L3, 89: CI/96; 108: C15/109; RG 5, A1; RG 68, General index, 1651–1841: 460. “Journals of Legislative Assembly of U.C.,” AO Report, 1913–14. Statistical account of U.C. (Gourlay). U.C., House of Assembly, Journal, 1828, app., public accounts for 1826–27. “U.C. land book D,” AO Report, 1931: 151, 157. Albion of U.C. (Toronto), 9 April 1836. British Whig, 30 Sept. 1836. Colonial Advocate, 18 May 1824; 29 Jan., 16 March 1826; 29 May, 31 July 1828; 22 Sept. 1831. Courier of Upper Canada (Toronto), 15 Aug. 1835. Gore Gazette, and Ancaster, Hamilton, Dundas and Flamborough Advertiser (Ancaster, [Ont. ]), 2 June 1827. Hamilton Free Press (Hamilton, [Ont. ]), 25 Aug. 1831. Hamilton Journal Express, January–February 1842. Kingston Gazette, 21–28 July 1818. Toronto Herald, 5 May 1842. Western Mercury (Hamilton), 22 Dec. 1831, 29 Aug. 1833. Canadian biog. dict., vol.1 Hazel [Chisholm] Mathews, Oakville and the Sixteen: the history of an Ontario port (Toronto, 1954; repr. 1971). Marion Robertson, King’s bounty: a history of early Shelburne, Nova Scotia . . . (Halifax, 1983). Walter Lewis, “CHISHOLM, WILLIAM,” in Dictionary of Canadian Biography, vol. 7, University of Toronto/Université Laval, 2003–, accessed April 19, 2019, http://www.biographi.ca/en/bio/chisholm_william_7E.html.